Following my recent piece about fake news, the phenomenon has continued to wreak havoc across the web, including in the recent UK general election. 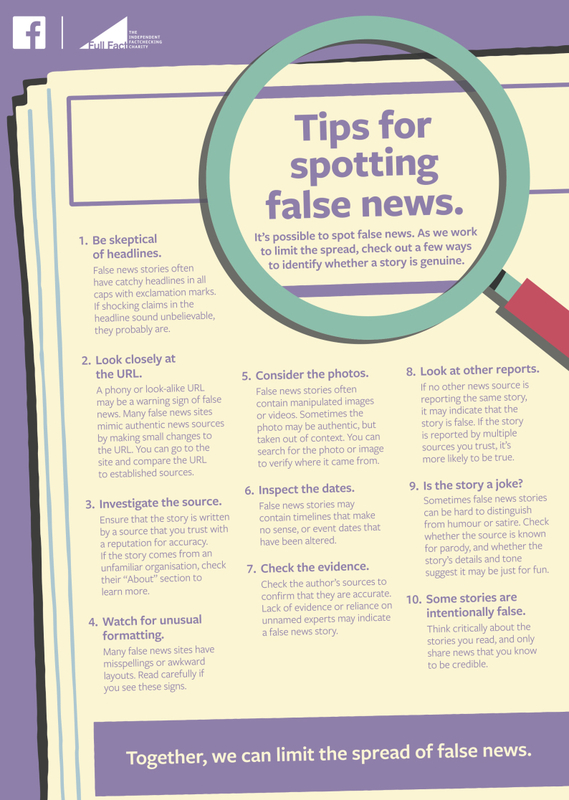 But steps are being taken to help the public to distinguish whether online articles are true or not. As reported by the BBC, Facebook has launched a nationwide campaign to raise awareness about fake news. It has published ads in a number of newspapers, as well as posting tips on its own website. This comes after Facebook admitted issues with political propaganda being deliberately spread on its website. This has led to calls from many, including MP Damian Collins, who is leading the Parliamentary inquiry on “the growing phenomenon of fake news”, for Facebook to do more to tackle fake news. He commented that such news is threatening “the integrity of democracy”. It sounds common sense when you see it written out like that, but it’s easy to forget when many of your friends are sharing a sensational story – and it’s even trickier when more-reputable online sources get suckered into it too. It’s common nowadays for lesser-known online news publications to draw content from other websites. There are even automatic tools/bots for doing this, known as content scrapers. In today’s media context of fake news, drafted by the unscrupulous or even the non-human, there is a greater need than ever before for original and trustworthy journalism. And it’s a cautionary tale for businesses – sharing a fake news article can drastically damage a company’s reputation. Google came under fire when users of its Google Home device (a smart speaker and virtual assistant) were told “According to the Daily Star Theresa May is our new prime minister but already online users have exploded with rumours that she is actually a lizard in disguise”. With it repeating content like that, it’s hard to trust the device! Taking out ads in traditional media (The Times, Metro, The Guardian and Daily Telegraph) has allowed Facebook to reach people who value the integrity of news associated with printed media. By going ‘old school’, it seems the social media website is cognisant of the fact that people are still going to the traditional sources for journalism they can trust.